Arty looking round pendant. 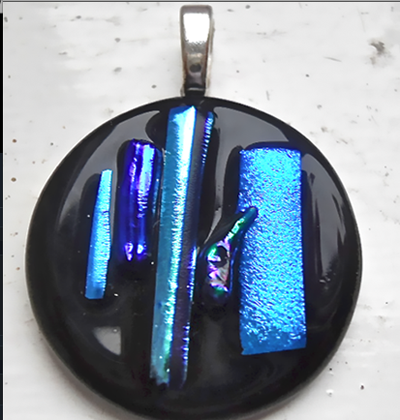 Black with pieces of Teal, Cobalt Blue and Turquoise Dichroic glass. It measures 3.3cm in diameter. The round base is Black and there are five different sized pieces of Dichroic glass on top all fused together. The large bail is silver plated and the pendant comes with a 16"x 1mm Sterling Silver snake chain. It comes in a Black card gift box.